This week, Kaisercraft is showing all their fantastic Kaisermists. I have created a layout with tutorial, using Kaisermists and the Always and Forever collection. 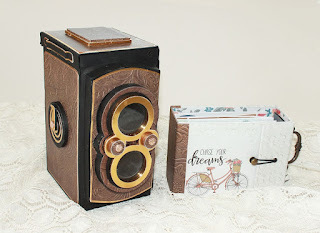 The background paper is one of Kaisercraft's fantastic speciality paper with a glossy embossed pattern, perfect for working with Kaisermists. 17th of May is our national day in Norway, we celebrate that our constitution was signed in 1814. We celebrate our national day with kids parades, national costumes and bands. The national costumes we use are different, depending on which region they are from, and they are often inherited from one generation to the other. This is my daughter, when she was little, in the national costume that was made for her great grandmother, almost 100 years ago. All the girls in the family has used it. 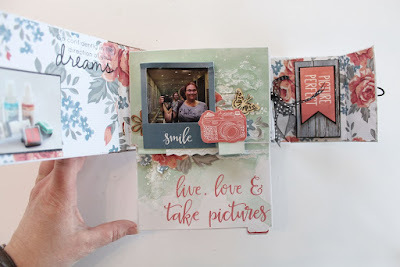 For this layout, I have used the specialty paper from the Always and Forever collection and Kaisermists. 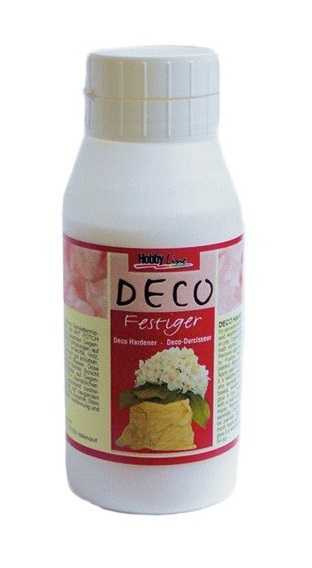 I have used a lot of different sprays and mists, but I must say that Kaisermists is my favourite. The colour does not bleed, when it is dry, and it does not colour gesso, if you add gesso to dry mists. 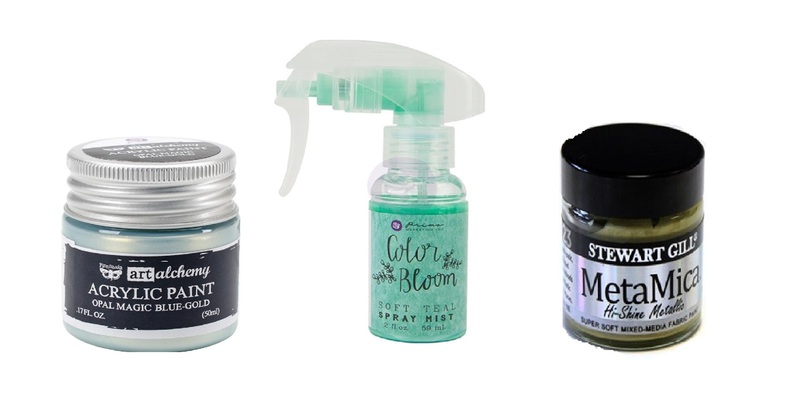 You may also use the mists to colour gesso, if you add the mists to the gesso. 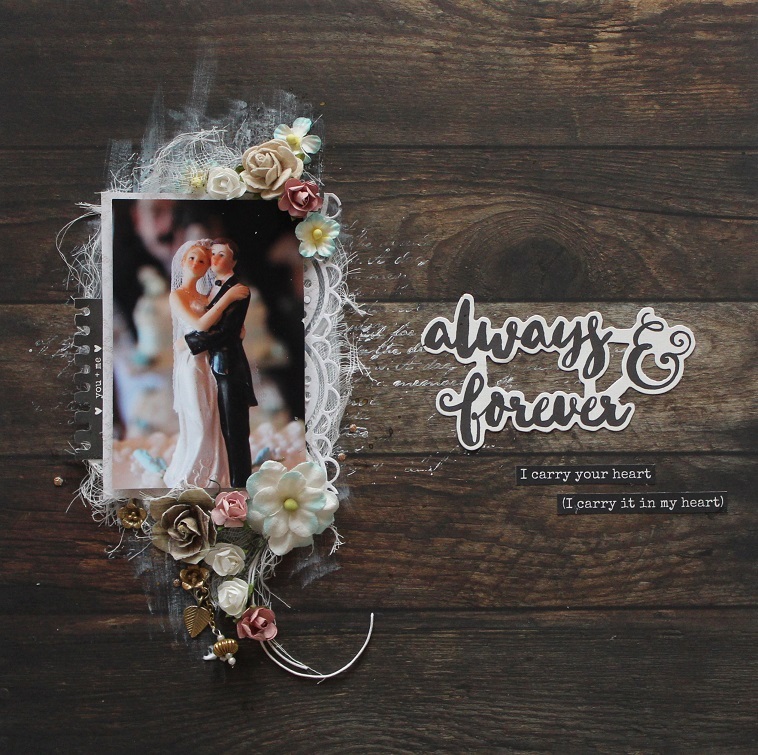 Kaisercraft products: Always and Forever collection: Crochet Doilies-Gloss, CD102 | P2095 Commitment | PP997 Paper Pad | GC105 Champagne glitter card stock | KM111 Kaisermist White | KM116 Kaisermist Aqua | KM106 Kaisermist Denim | KM101 Kaisermist Charcoal | DD755 Decorative Die Lace Boarder | DD504 Decorative Dies Doilies | DD547 Decorative Die Circle Vines | DD748 Decorative Die Summer Words | LDB1055 Wooden shapes Flowers | LDB1053 Wooden Shapes Butterfly | SB710 Rhinestone Orange | F644 Mini Paper Blooms Coconut | F647 Mini Paper Blooms Iceberg | F632 Paper Blooms Sage | F627 Paper Blooms Coconut. Other: White acrylic paint, straw, string and embossing powder. Here I have created some Frozen birthday inspiration for Hobbykunst. 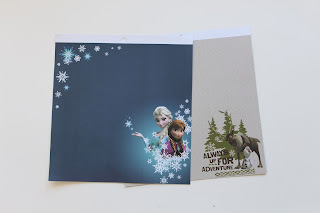 I chose two papers from the Frozen paper pad, One paper for a girl's birthday party and one paper for a boy's birthday party. IIn this blogpost. 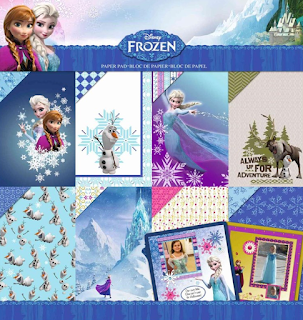 I am showing products created with the Anna and Elsa paper. This git wrap has been created with an old Pringles box. The paper has been glued onto the box with double sided tape. I have also created a lid that looks like the roof on a castle tower. 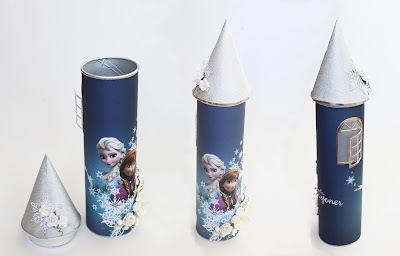 This type o box can also be created for boys, decorating it as a rocket or a masculine castle. The box can be filled with whatever you want. For a 5-6 year old, craft things are always popular. 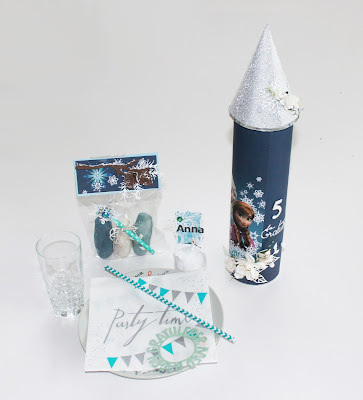 I have added some examples of gift fillings from Hobbykunst: Colouring pencils, markers, colouring pad, paint, glue, scissors, clay, beads, glitter, hand dolls, clear acrylic hearts, some sheets from the Frozen paper pad, or something to create Frozen cupcakes. The papers are really cute as they are, and you don't really need a lot of extra decoration. Here, I have used some white flowers, and white leaves, dies out from Kaisercraft's glitter cardstock. The number 5, is a Kaisercraft dies. 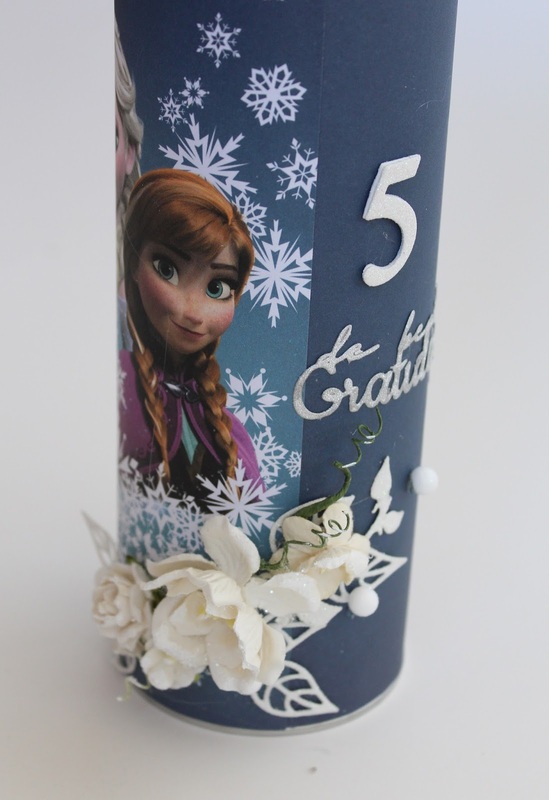 I have used white foam board and Kaisercraft's glitter cardstock to create the number..
"De beste gratulasjoner" is a dies from Papirdesign, it had been created with glitter card stock.. The top of the box has been created as a cone. The bottom of the cone, has been created 2 cm larger in diameter, than the box. This makes the cone hang one cm out of the edge of the Pringles box. To create the lid and the cone, the easiest thing is to create the circle at the base of the cone. 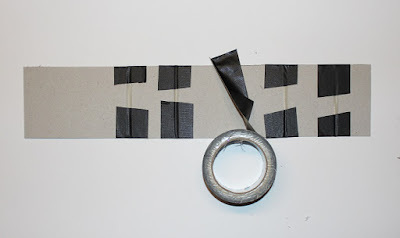 Then create a cone from paper, and cut it to fit the circle you created. Glue the cone to the circle with a glue gun. Then, cover the cone with the glitter card stock. 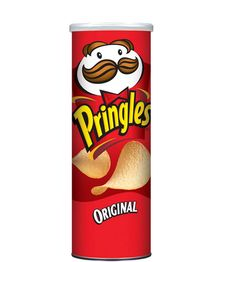 The inside of the lid, has been created in the same way as I created the lid for these boxes.. Take measurements of the Pringles box inside, and create the circle in the lid about 4mm smaller in diameter, than the inside of the pringles box. I decorated the inside of the lid with silver cardstock to make fit the inside of the Pringles box. The roof / lid has been decorated with a snowflake, created with a Rayher snowflake dies and some white flowers. Here, I have created a place card. The paper is left overs from the paper on the box, but I have used the back side of the paper. The snow flake has been created with Rayher snowflake dies. 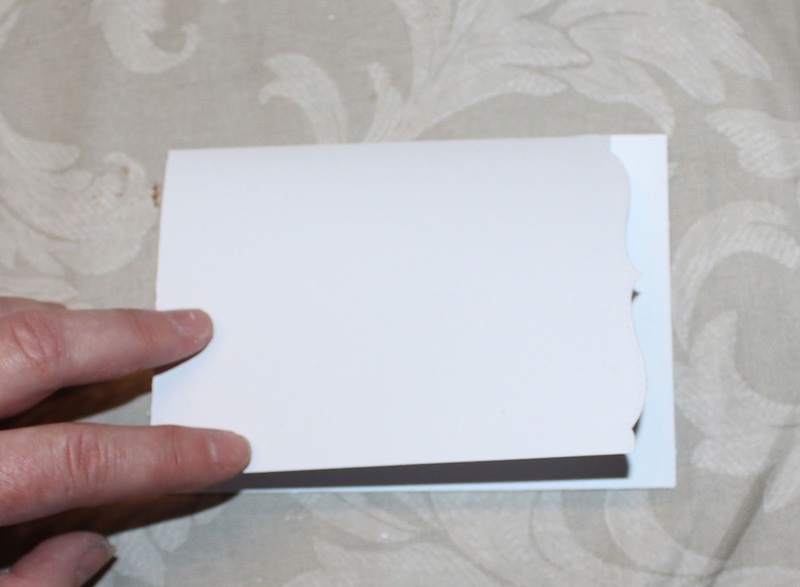 The base for the card, has been created with a styrofoam ball. It has been divided in two, and created a slot for the tag in the top of the ball. The snowman and the small snowballs has been created with tiny styrofoam beads. The name has been made with Sticy letters. A lot of kids get a small treat bag, to bring home after birthdays. 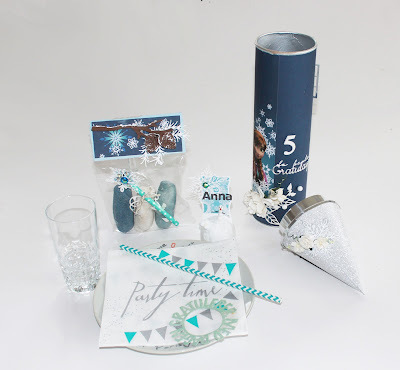 I often think, the kids get enough sugar during the birthday party, and a treat bag with home made glitter clay, can be more then welcome as a treat. It is not dangerous to eat a little bit of the clay, but it contains a lot of salt and will not taste good. Mix the ingredients, heat it in a pot, until it has the consistency of clay. The clear plastic bag has been a bag I have got for cardmaking. 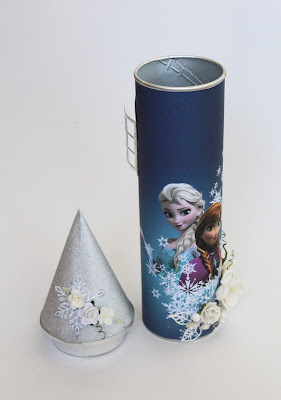 The topper has been created with the last bit of the Frozen paper. The branch has been cut from brown cardstock. The pine branches and the cones has been cut with pine branch and cone dies from Rayher. The snow flake has been cut with a Snow flake dies Rayher. The snow on branches and cones has been made with a snowpen from Rayher with white glitter sprinkles over it, before it has dried. 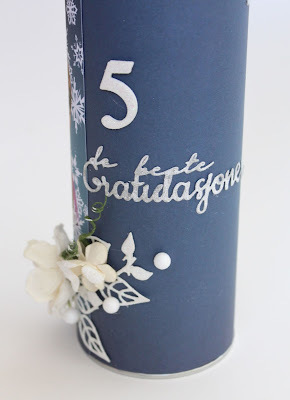 This is a fantastic simple way o creating detailed snow effect, easier than using snowpaint and a paint brush. 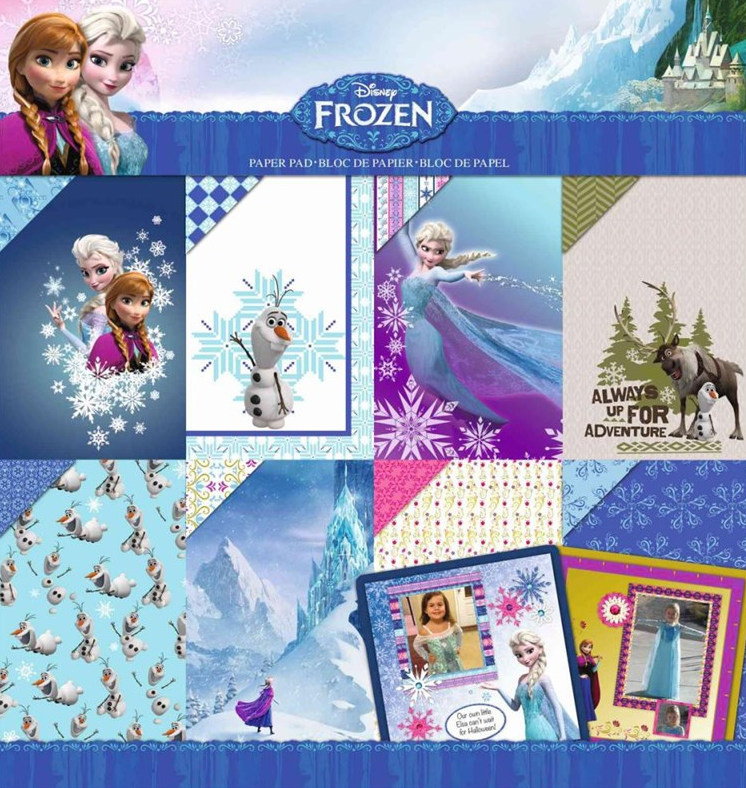 Do you need more Frozen inspiration? Hobbykunst has a lot of Frozen things for parties. 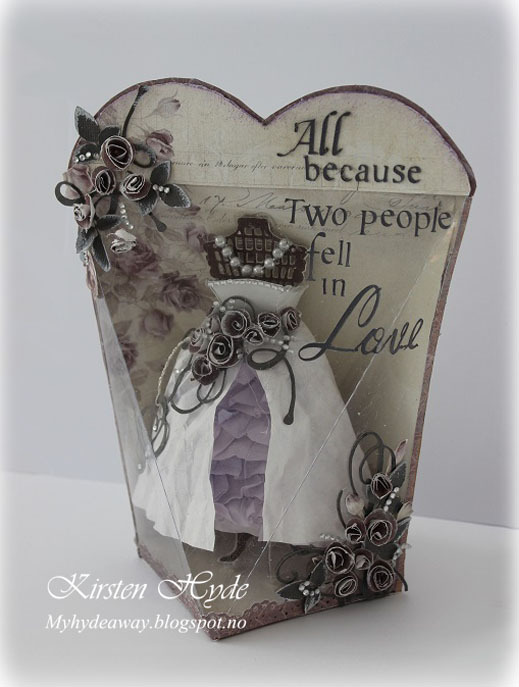 I have created another layered wedding layout for Kaisercraft. This time, I have used the fantastic blue colours of Mermaid Tails and the clear white gloss specialty paper. 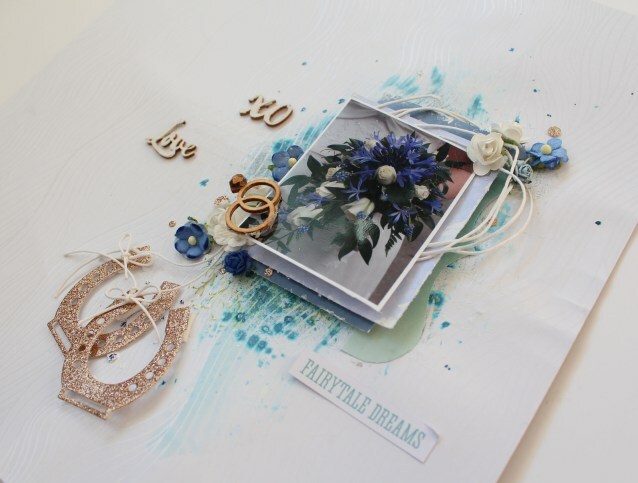 I have also used Kaisercraft’s horse shoe dies together with the new Glitter card stock. I do love using this glitter card stock. The paper is thick, which is important when you are using dies together with the card stock. 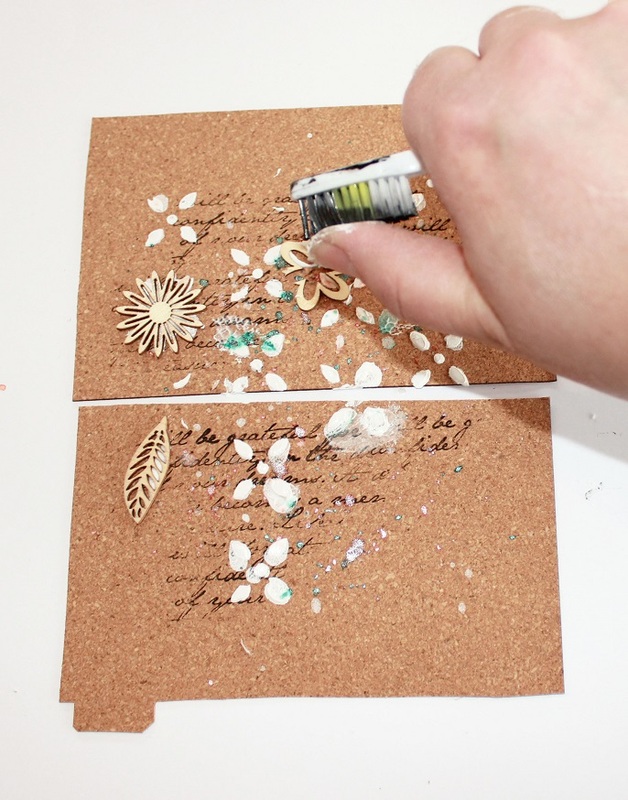 Also, the glitter doesn’t sprinkle everywhere, but it is stuck to the paper, and that is also a big bonus. I have sprayed with Kaisermist and water on the background, to create some colour on the specialty paper. The mist will colour the background, but not the embossed pattern. Kaisercraft Product: Mermaid Tails: PS451 Waves Gloss | PK534 Papaer Pack | SS312 Sticker Sheet | Clear Stamps | GC106 Glitter Card Stock Bronze | PL575 Flourish Pack Wedding | F644 Mini Paper Blooms Coconut | DD352 Decorative Die Horseshoe and Badge | KM106 Kaisermist Denim | KM116 Kaisermist Aqua | KM 111 Kaisermist White | IP733 Ink Pad Vine | CS257 Background Script clear stamps. 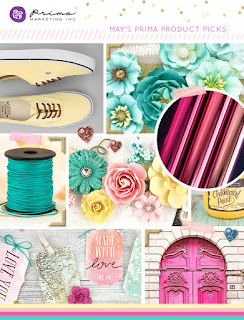 This layout has been created for my May post for Kaisercraft. I often go for walks with my camera, just in case I see the “perfect” photo scene. This photo, of a little bird family, was taken on a walk through a safari park in England. 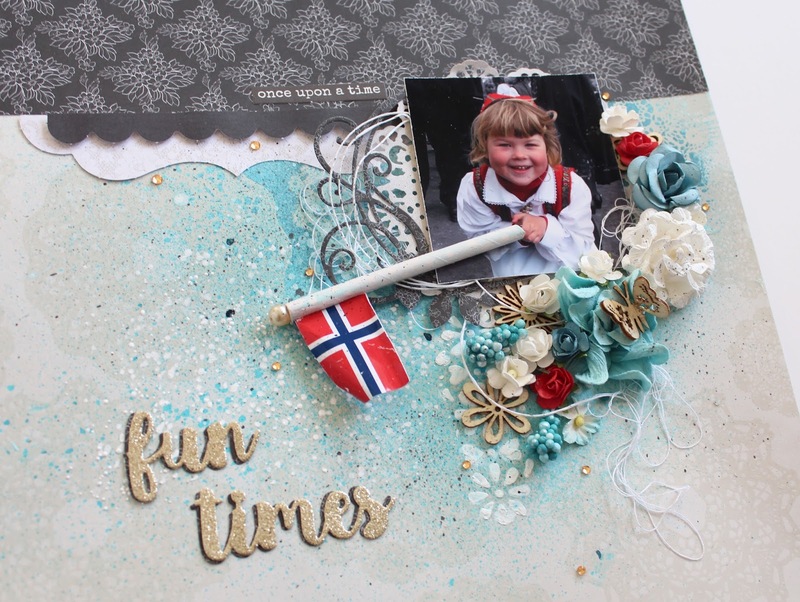 The layout has been created, using the paper P2096 Devotion. I used two pages of the same paper. 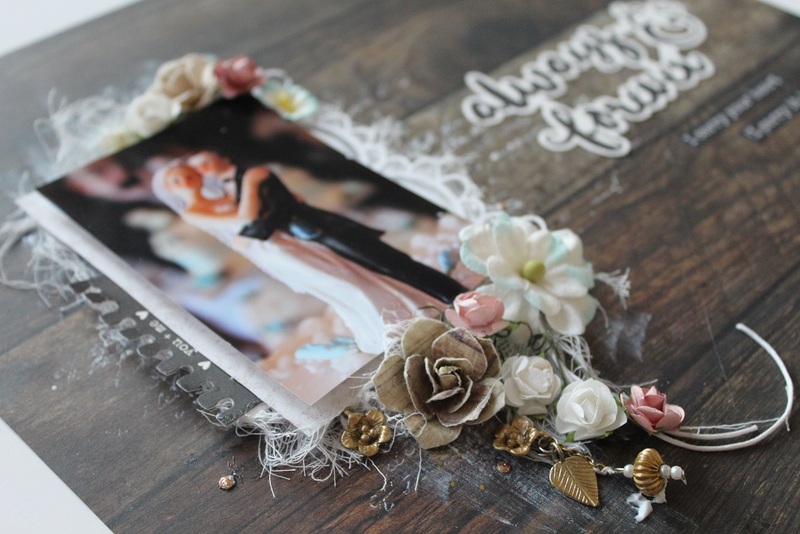 I cut of the lace at the edge of the page, used that as a layered decoration behind the photo. 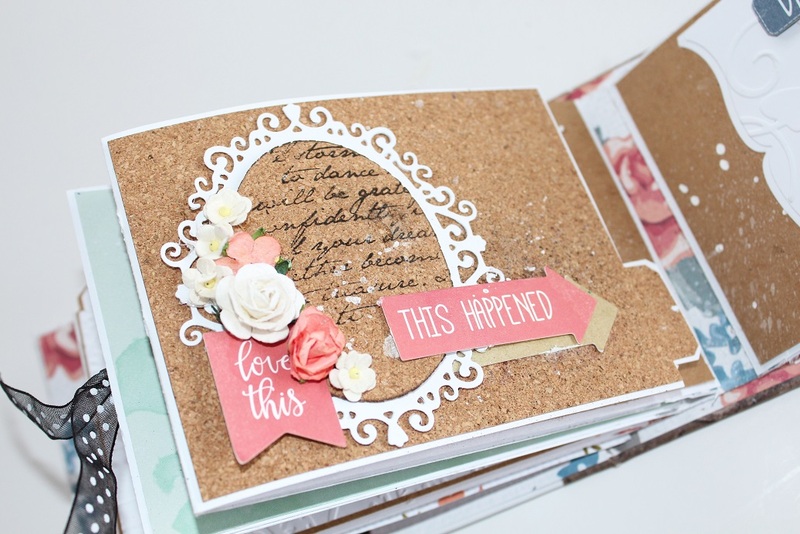 The rest of the page has been used as a base for the layout. I used a background stamp, CS257 Background Script clear stamps and gesso on the background. I have also used flowers and leaves from the collectables, as decoration. 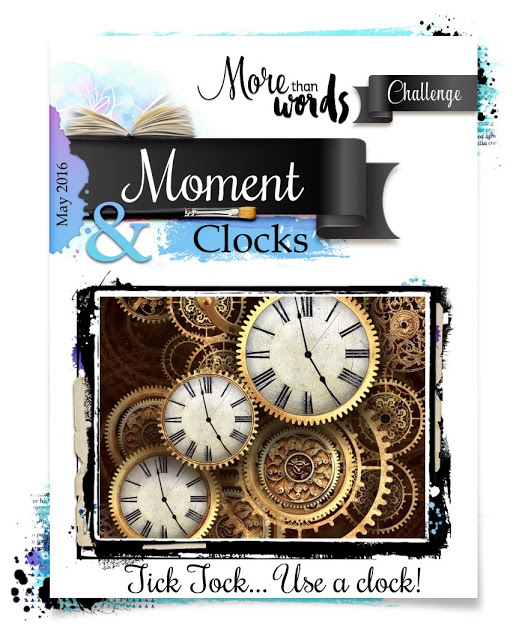 The text ” little moments” is a created with a die and a foam sheet. There is also diecuts with a lace boarder in between the paper lace. Some of the left overs from the diecut has been used to the left of the page. I have also added pink Rhinestone to the page at the end. 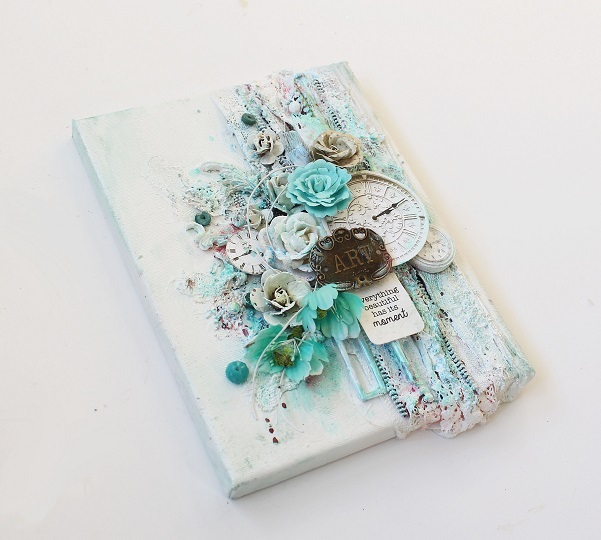 Today, I am showing a mixed media canvas created for Hobbykunst. 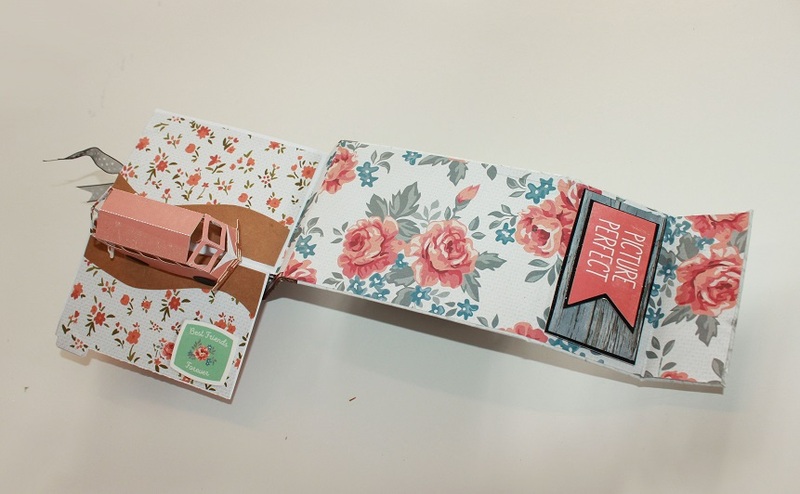 This is a Prima based project, with some small elements from Kaisercraft and Wild Orchid craft. I have used cheese cloth, zippers, lace and fabric hardener. Everything has then been painted white with acrylic paint. Then I used different mists and sprays to colour the canvas. 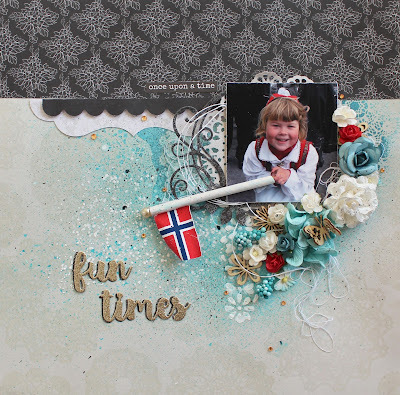 You can find the video tutorial at the end of the blog post. Basic materials: Canvas, cheese cloth, laze, old zippers, beads, metal embellishments and flowers. Fabric hardener from Hobby Line. Mixed media glue, from Liquitex - Super heavy gel. 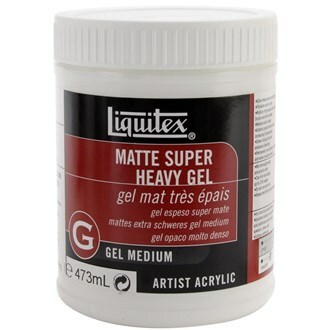 This glue comes in different sizes, I try to get a liter of glue at the time (but then I do a lot of mixed media and I give classes). I have used Prima's blooms spray, Finnabair's Opal Magic and Mica Powder, as well as Stewart Gill's Meta Mica. I often save old paint brushes. They are brilliant to use in projects like this. Most of the flowers here, are from Prima. Hobbykunst has a lot of different flowers, a lot of brand new ones, and a few on sale. 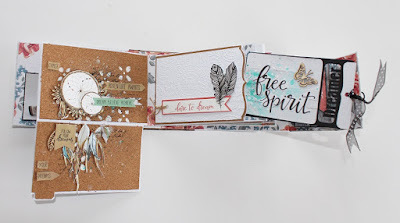 I just love Kaisercraft’s wooden papers, and get drawn to them in each paper collection. 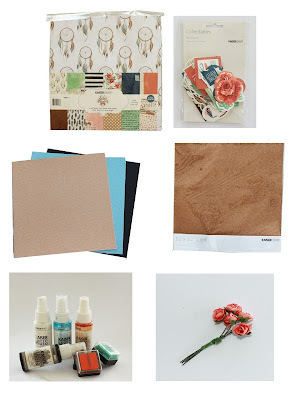 This brown wooden paper is no exception. I have tried to make a romantic wedding layout with this rustic paper for Kaisercraft Design Team's wedding post today. 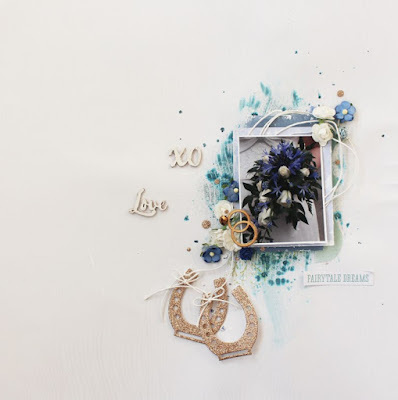 Kaisercraft Products: P2089 Romance | P2094 Endless Love | PP997 Paper Pad | CT856 Collectables | KM102 Kaisermist Antique Gold | CS257 Background Script clear stamps | DD755 Decorative Die Lace Boarder | GC106 Glitter Card Stock Bronze | | F644 Mini Paper Blooms Coconut | F659 Mini Paper Blooms Dusty Pink. 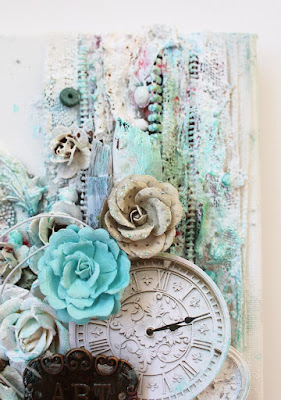 Other: Cheese cloth, cotton string, old jewelry and gesso. For some reason, I really love creating paper dresses. I guess it challenges me in some way. Designing dresses is an art form that I truly admire. I have sew quite a lot of dresses for myself and for my daughter. This was often due to often not finding "the right dress" for myself, and it was easier to to make one. Creating a lot with paper, combining crafting with paper and dressmaking, is a fantastic mix. Although creating paper dresses, often involves skills in dressmaking and knowing the difference in the material you are working with. Paper has a completely different way of folding and "behaving" when you work with it. This also depends on the paper brand, as the quality of the paper is completely different. For now, I have made 5 paper dresses, but I still have a few dresses ready in my head. 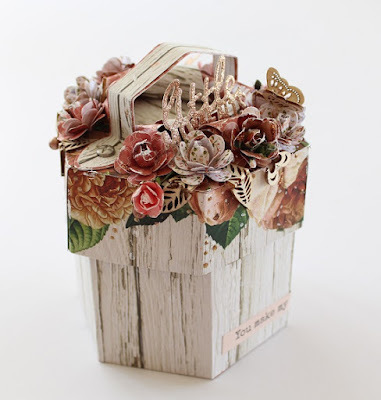 This miniature wedding dress in a box, was created as a wedding card for the magazine Ett trykk. The box itself is 18cm tall. 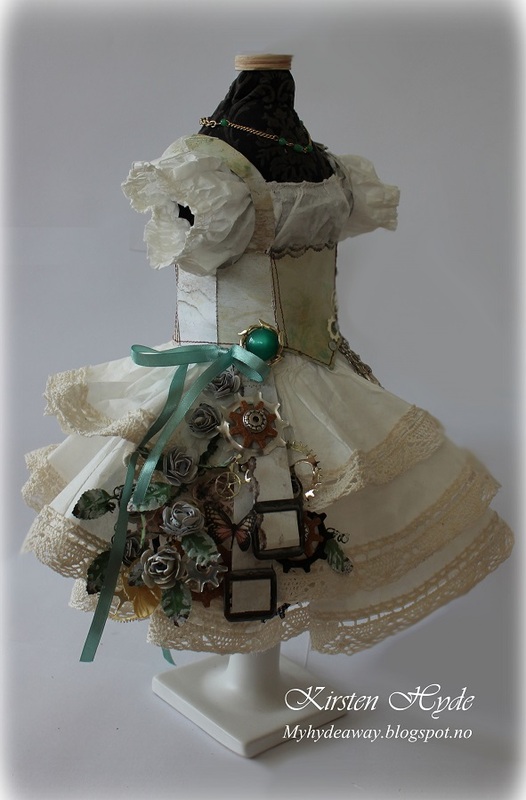 The dress has been sewn with a sewing machine with coffee filters. 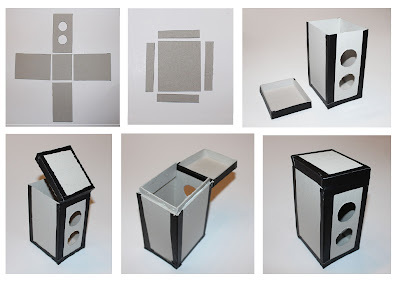 The box has been created with acetate and papers from Pion design. The flowers for the dress has been hand made. This dress was also sewn out of coffee filters and lace. The dress itself, is sewn as a dress. It has a zip at the back, and can be taken of the dress form. 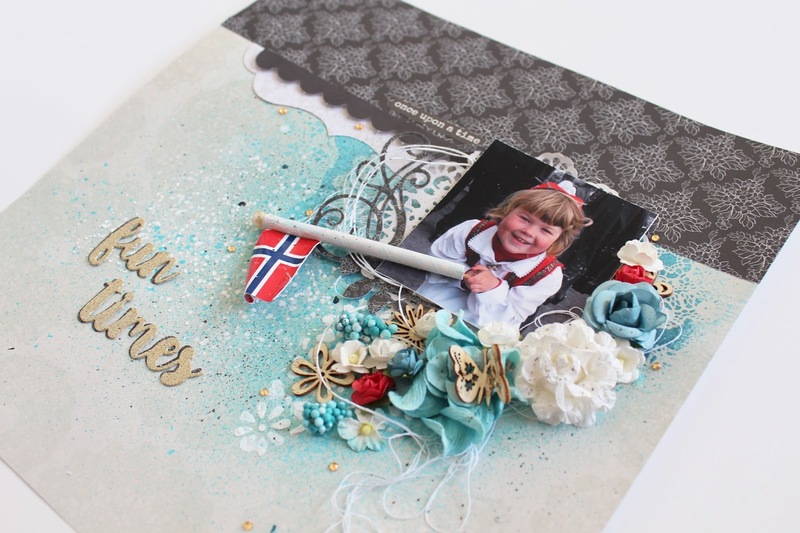 Papers here are from Prima. The dress form is also hand sewn, from a pattern I found online. You can find the pattern here. 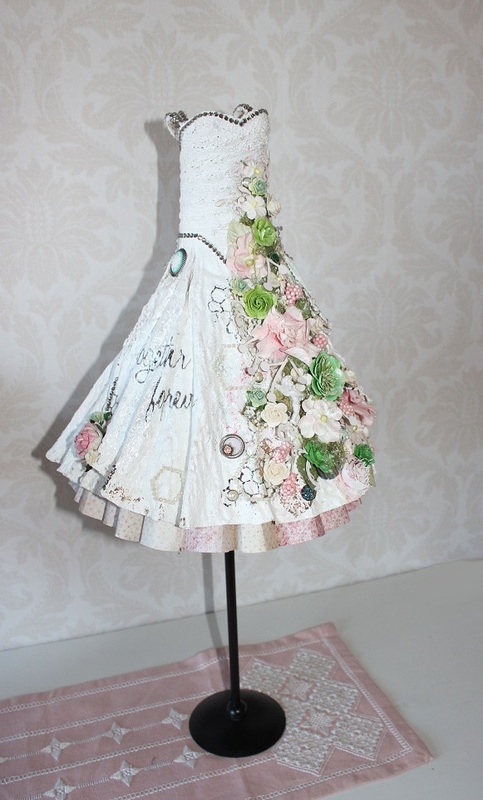 This dress was created for Prima's design team call last year. I applied for Prima and Kaisercraft. 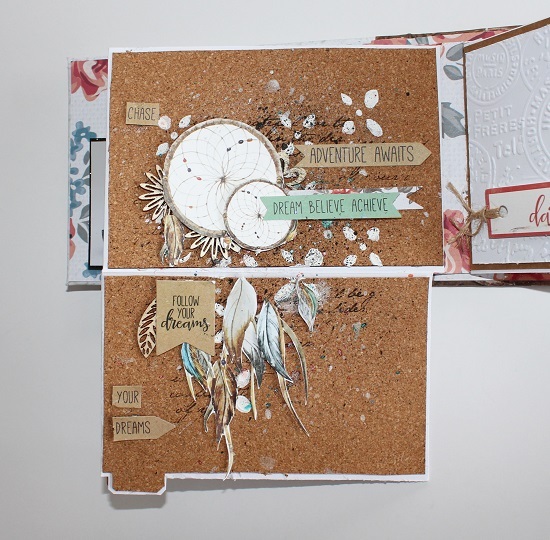 I did not make it to the Prima design team, but I was so pleased to make it onto Kaisercraft's design team. The dress form is hand made. You can find the dress form tutorial in my blog. The dress itself is made with an underskirt, with the long ruffles over it. Then I created a crinoline and added the ruffles. The ruffles had to be gently created to fold in just the right place. The pattern for the dress, was made about 5 times. I used about 100 hours to create the dress. All the flowers for the dress has been hand made. 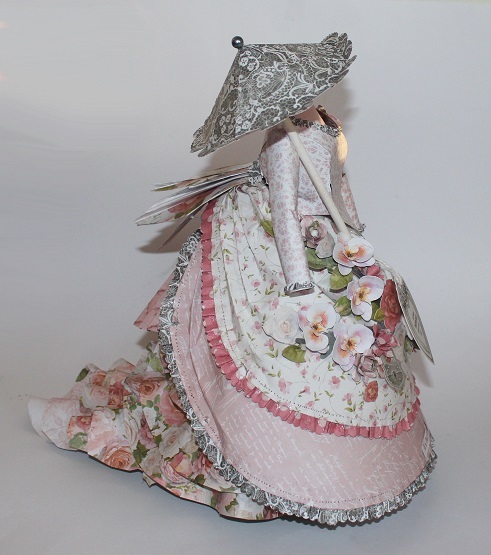 This dress was created for Kaisercraft, and was shown at CHA - spring 2016. The dress has been created with the Cottage Rose collection, and it is based on historical information of how they were sewing dresses in the 1970s. The dress has been created around an underskirt. Then I created a crinoline, and fixed the ruffles to the crinoline. I also added a bustle at the back. The flowers are hand made. Creating thing for CHA, is often difficult. This is because you have very short time to create the items and get them sent back. My papers was stuck in Melbourne, so I totally had 3 evening after work to design for CHA. I used two days to create the pattern for the dress and an evening to create the dress itself. The 1870s dress; original blog post. This dress was created with Fabric hardener and cheese cloth. Then I added an underskirt created with papers from the Tales of you and me from Prima. 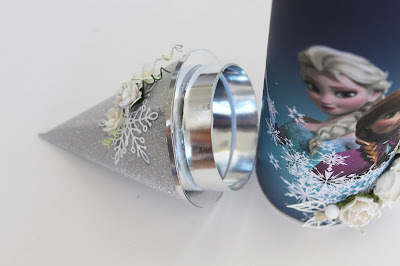 There are also tutorials on how to decorate the dress in the blog. Prima wedding dress; original blogpost. 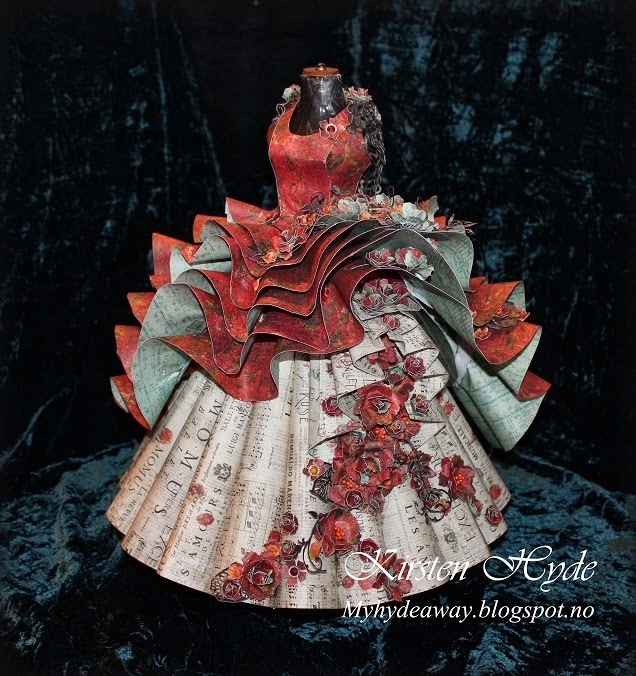 Where Do I start to create paper dresses? 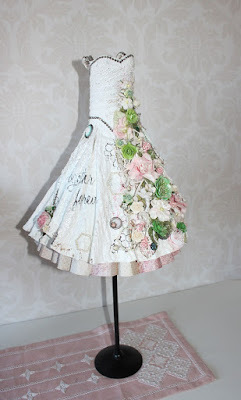 If you are thinking about creating paper dresses. The first thing you need is a dress form. If you don't manage to get hold of one, you may chose to create one yourself. Creating dresses can be an advanced task. Creating my Prima Bella Rouge dress or the Kaisercraft 1870s dress involves skills in dress design and pattern making, that you would learn while you take your specialist tailor education, and can therefore not be explained in a blog post. Creating dresses with coffee filter is often a good start, since that paper is easier to work with. Fabric hardener and cheese cloth or lace is a good and easy way of creating dresses. I have created a tutorial on how to use fabric hardener to create a dress. When you make a paper dress, try to first make it in copy paper. It is normal to create a pattern before the dress is being made. This is also where you make adjustments to the pattern. 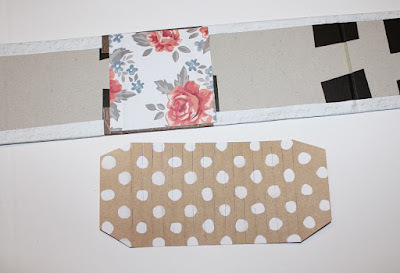 When you are satisfied, you use the copy paper dress as a pattern on your patterned paper. Then you create your dress out of patterned paper. Remember that the quality of paper is very different. Some papers thick papers, and sometimes you would have to soften the paper with water to make it curve if you make large ruffles. 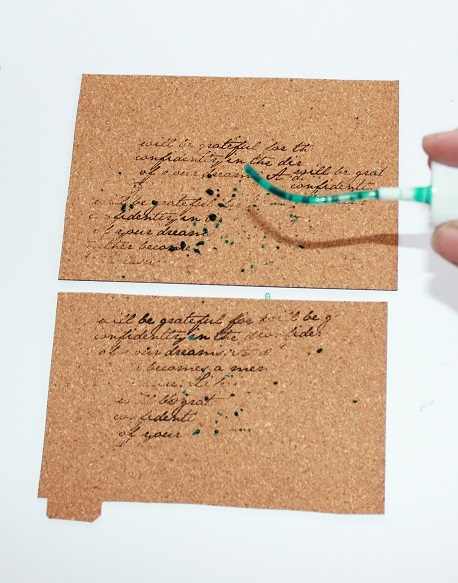 Take care when you add water to paper, as it might dissolve if you are not careful, so take care. Some papers are very thin paper, it folds easily, but it is not very strong for 3D creations. Therefore, you might want to use card stock for support in some places (making sure the support card stock doesn't show). best of luck in creating your own paper dress. 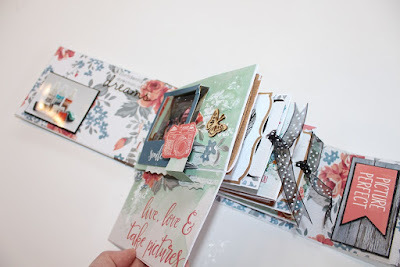 Today, It is my turn fot my montly blogpost in Kaisercraft's blog.This time, I heav featured a lot of Kaisercraft's dies in the blogpost. One of the items I have created is a a small gift box created with the always and forever collection. 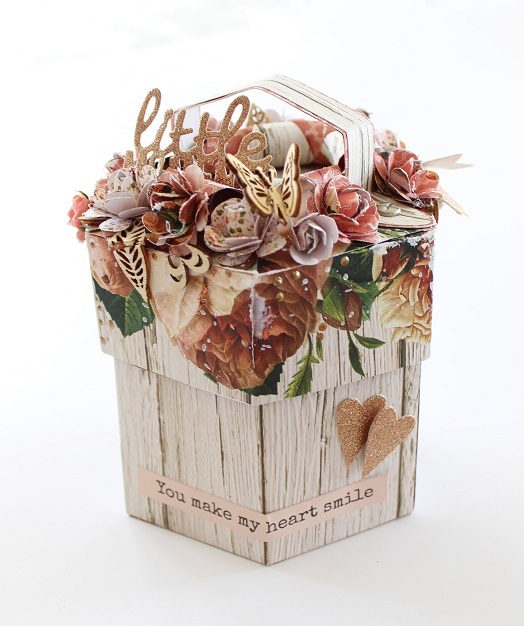 This is s small mothers day gift box created with the always and forever collection. The hearts has been made with a flower die (DD707) and golden glitter cardstock. 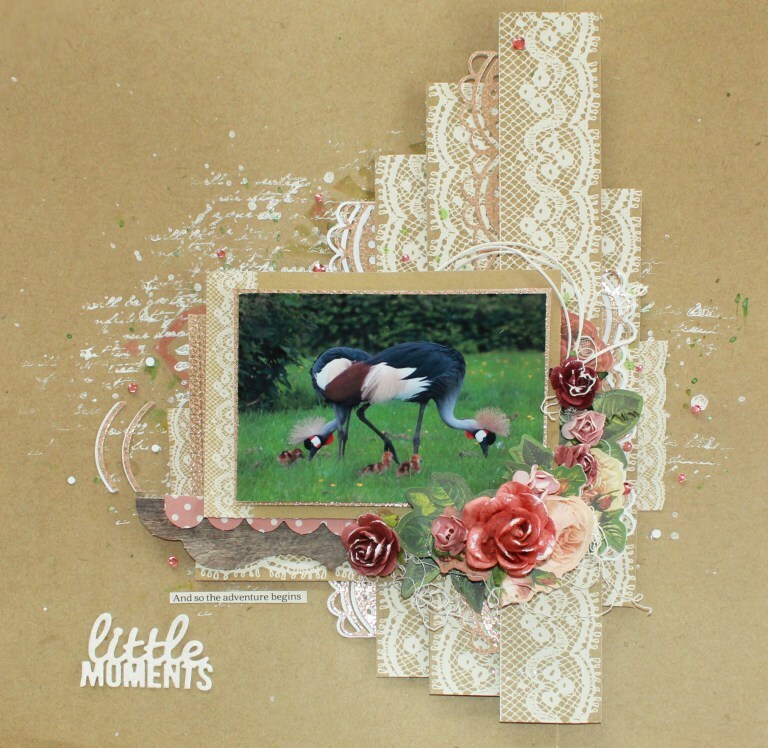 The words "little moments" has been created with a die (DD147) and golden glitter cardstock. 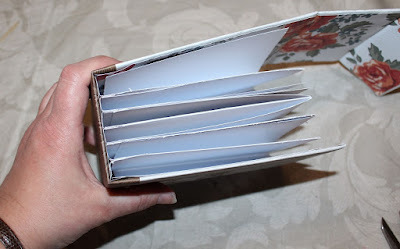 On the top of the lid, I have added layers of paper, and curled it up towards the edges. 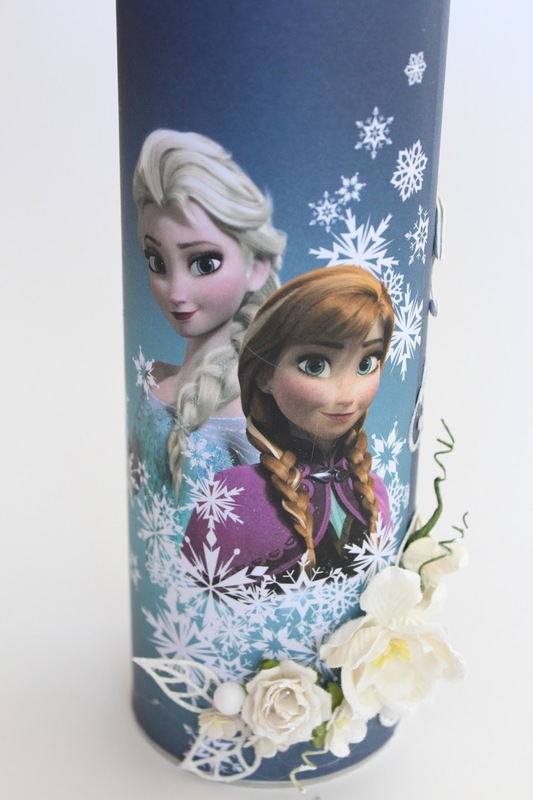 I have added flowers around the side of the lid. The roses are hand made, using a flower punch and a glue gun. I have added gesso and stickles to the flowers for effect. The leaves and butterfly is wooden embellishments from Kaisercraft. 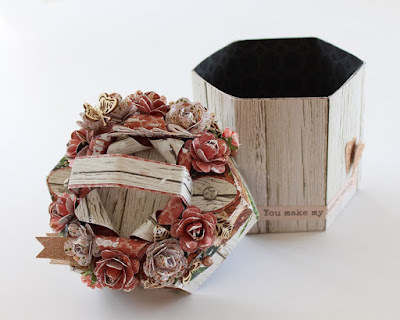 The box has been covered with dark patterned paper inside. 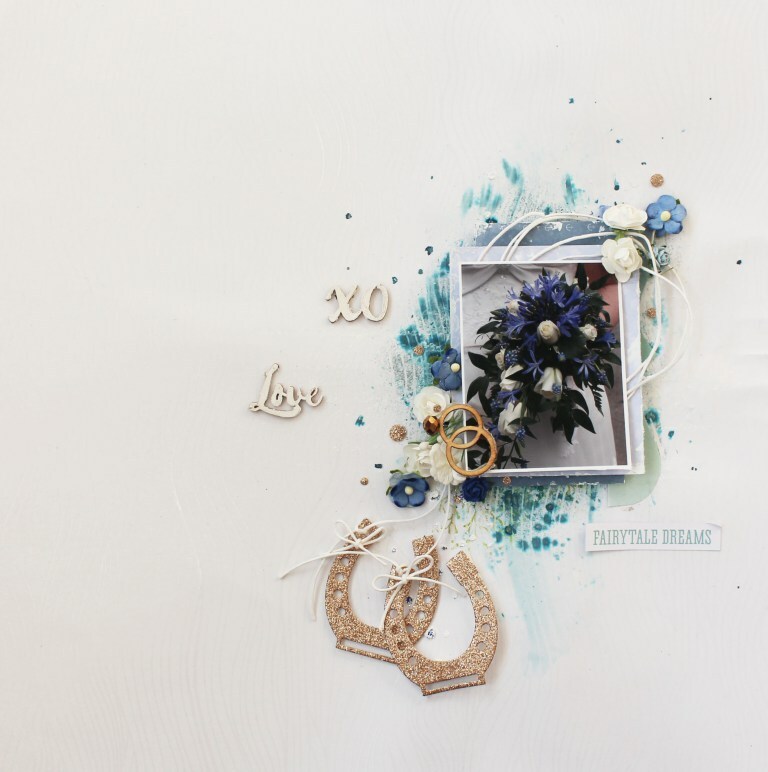 Kaisercraft materials: Always and Forever collection: P2091 Lovable | P2090 For Keeps | SS313 Sticker Sheet | PP997 Paper Pad | DD147 Decorative Die Words Little moments | DD914 Decorative Die and stamp Cute tags | DD707 Decorative dies layered flowers | GC107 Golden Glitter Cardstock | LDB 1053 Wooden shapes Butterfly | KM111 Kaiser Mist White | F667 Mini paper Blooms Coral. 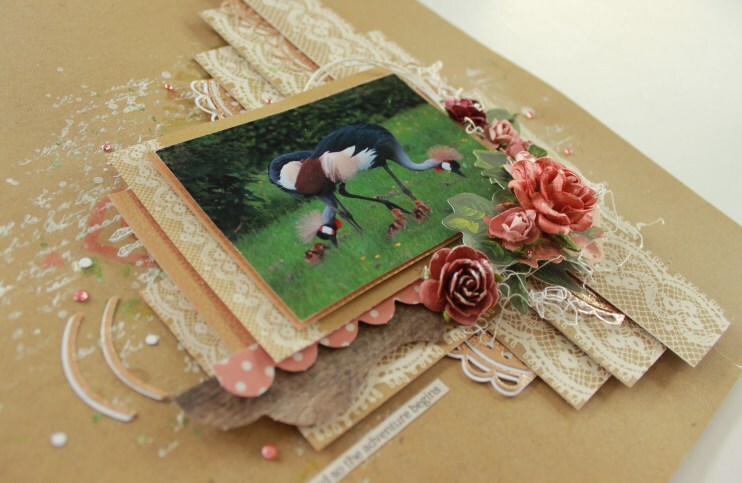 It is the time for the final round for Kaisercraft's design team for next year, 2016 - 2017. I have really enjoyed being on the design team this year, and would love to get another chance. I have tried to capture my dreams in this final, and created a vintage camera (Rollei flex) with a mini album inside. All the finalist got the same kit to work with. Boho dreams collection with papers, collectables and stamps, together with cork cardstock, Kaisermists, stencils and flowers. 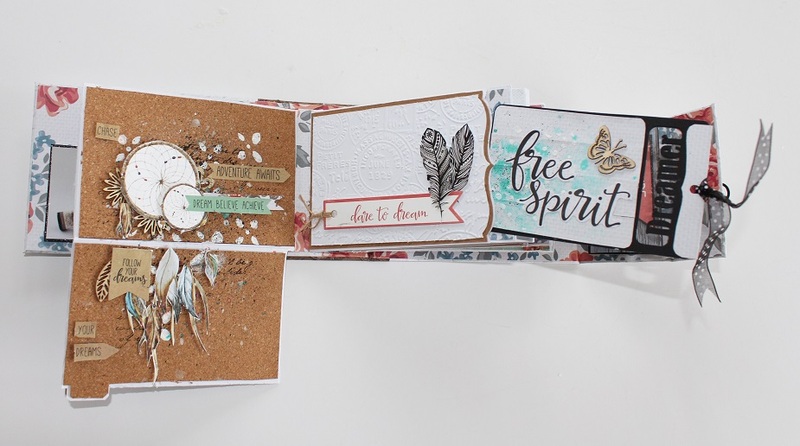 Kaisercraft products: Boho dreams collection: P2106 Dreamcatcher | P2107 Feathers | P2108 Young | P2109 Wild | P2110 Free | P2111 Wanderer | P2112 Daydreamer | P2113 Bohemian | P2114 Adventurer | SS315 Sticker Sheet | CS266 Clear Stamps | CT856 Collectables | CB152 Cork Sheets | CD650 Cardstock Smooth White | CD651 Cardstock Kraft | GC101 Midnight glitter cardstock | GC111 Frost Glitter cardstock | GC107 Golden glitter cardstock | KM111 Kaiser Mist White | KM107 Kaiser Mist Peach | KM106 Kaiser Mist Dream | KM101 Kaiser Mist Charcoal | IP729 Ink Pad Tangello | IP719 Ink Pad Black | EF 229 Embossing Folder Postmarks | EF237 Embossing Folder 4x6 Butterfly flourish |DD369 Decorative Die Oval Vintage Frame | DD547 Decorative Die Circle Vines | DD748 Decorative Die Summer words | DD129 Decorative Die Words The little things | DD706 Decorative Die Cogs | F667 Mini paper Blooms Coral | CS257 Background Script clear stamps | CS152 Texture Diamonds Clear Stamps | LDB 1053 Wooden shapes Butterfly | LDB1055 Wooden shapes Flowers | FL575 Flourish pack Wedding | T628 12x12 Template Floral quarters | TG23 Template Christmas Quarters | IT912 Feathers (will be published in June) | ST928 Clear Stickers Life | TM812 Kaisercraft Treasures Drawer knobs Brass (lock on the album). To find inspiration for my projects, I start with looking at the papers, colours, patterns and shapes. The Boho dream collection is full of dream catchers, feathers, bicycles and vintage cameras. 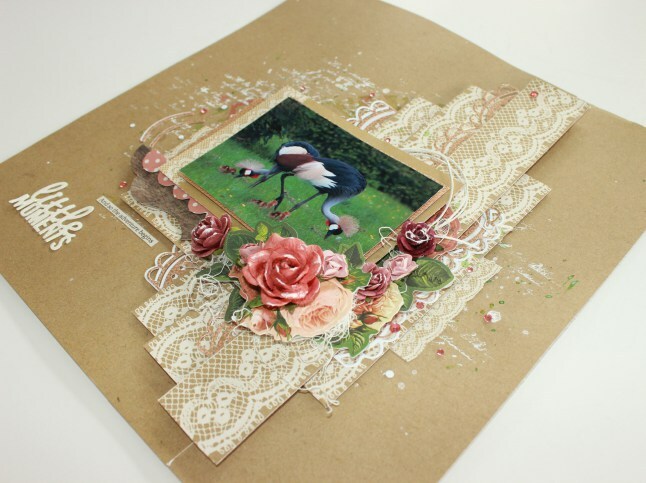 I really enjoy creating of the page items, together with mixed media, cards and layouts. I wanted to combine the four in one project. I created a vintage camera with a mini album inside. 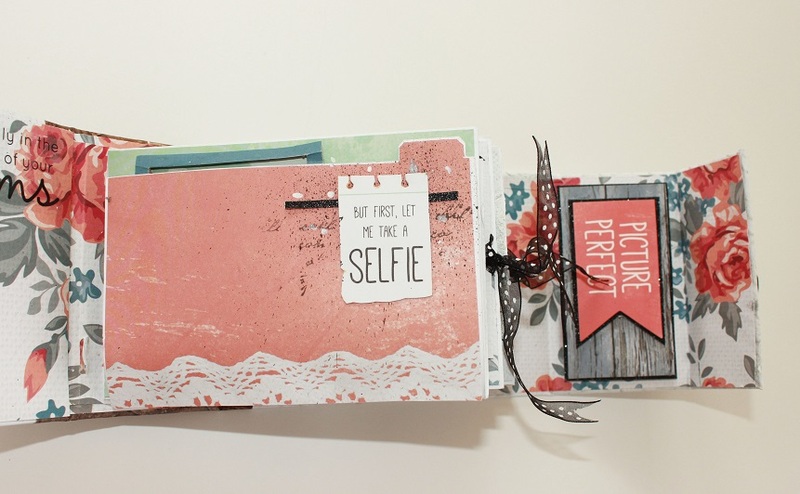 The mini album is describing me a bit as a crafter, as I enjoy creating a lot of mini albums from scratch. The camera is also quite personal, as my dad was a photographer, and he gave me a camera when I was six years old, and tough me a lot about photographing as a grew up. 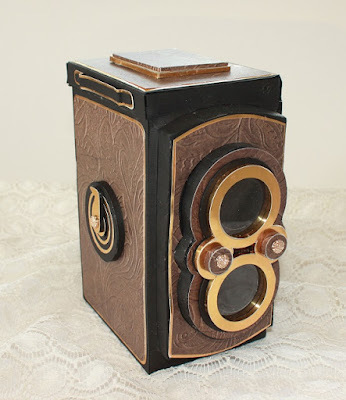 The vintage camera has been built from scratch. I used photos of Rollei flex cameras as a model for the camera. The lenses for the camera is created with acetate sheets. The hinge at and the knob at the side turns around. The camera was built in cardboard. 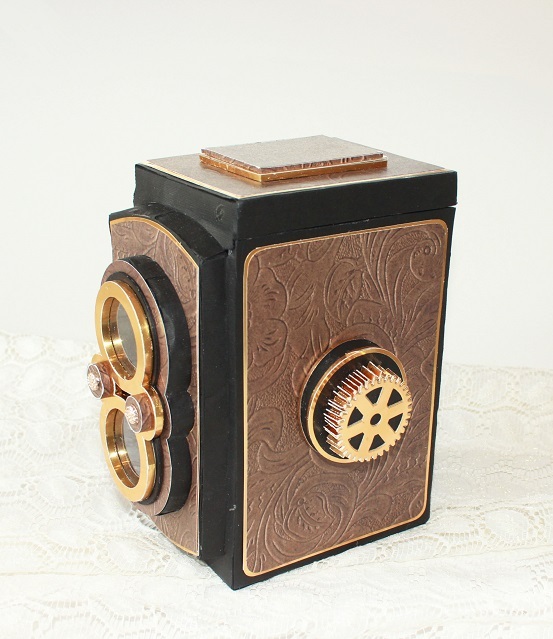 It is built as a square box, opening in the lid and lenses at the front. The box was measured to fit the minialbum. The pieces was cut out of cardboard. 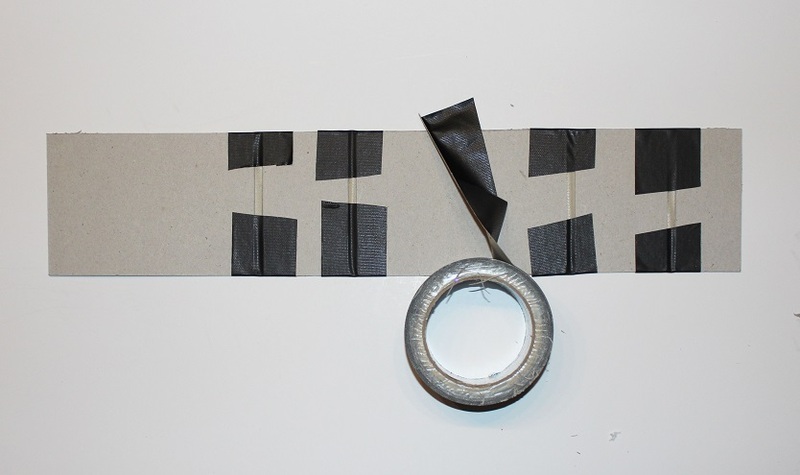 The lid and the box was glued together using strong tape. Then I added the lid to the box, using the tape as a hinge, at the front of the camerabox (bottom left photo). I added the tape to the inside and outside of the box, to make it stable. I added some strips of cardboard on the inside of the top of the camera (picture in the bottom middle) to make the lid stable, when it is closed. This was my main box for the camera. Then I covered the cardboard camera with black cardstock, and created panels out of the paper P2106 Dreamcatcher, and added golden sheets under the panels to create the golden edges. The minialbum has been created from scratch out of cardbard and cardstock. The cover pages were cut out of card board. 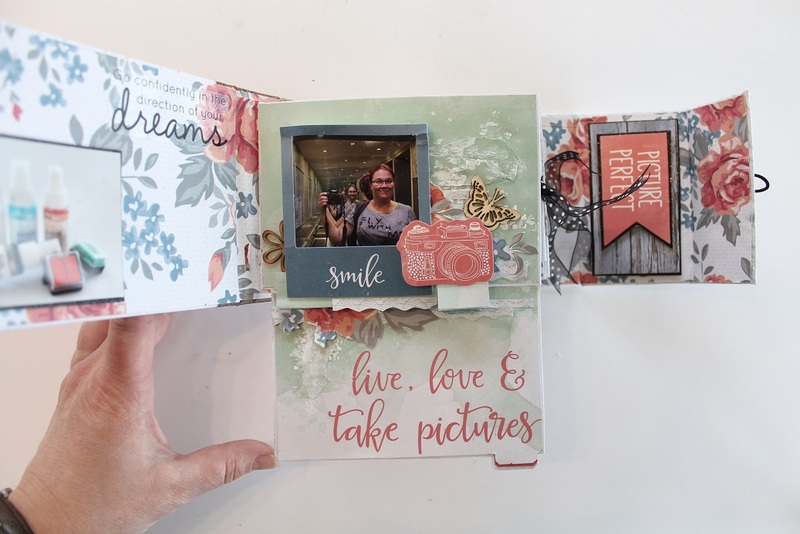 I generally make the cover 1/2cm larger than the album pages on the top, bottom and the side (not at the back, as the pages are mounted close to the back of the cover). 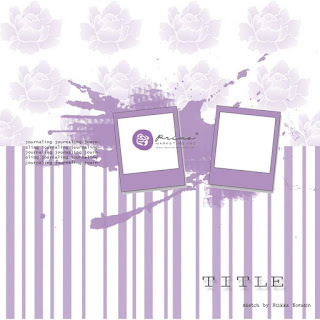 If I add extra tags, I might make the cover even larger. 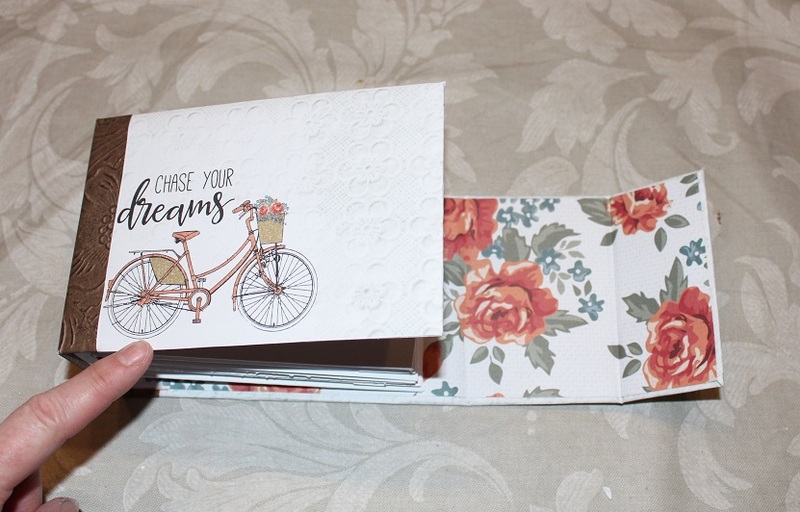 I have also added two extra sides on the right in the photo, because I wanted the album to fold around itself and lock at the front. I have added the measurements on my cover. 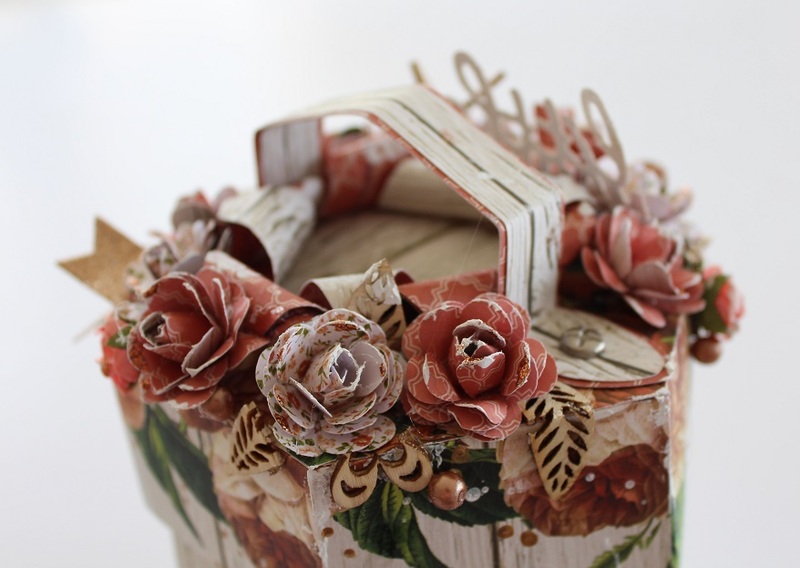 (My pages are 10cm high and 14,5cm wide). 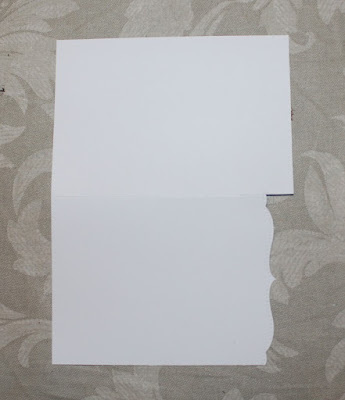 I glued the pages together with strong tape, making sure there is 1/2cm in between the card board sides. By doing this, there will be space for the cover to bend and open. Then I covered the front of the album with patterned paper, as you would cover a school book with paper or plastic, to protect it. Making sure that the bike pattern on the front is kept as I would like it be. Then I added paper on the back of the mini album. I chose to have a leather look at the back of the book. 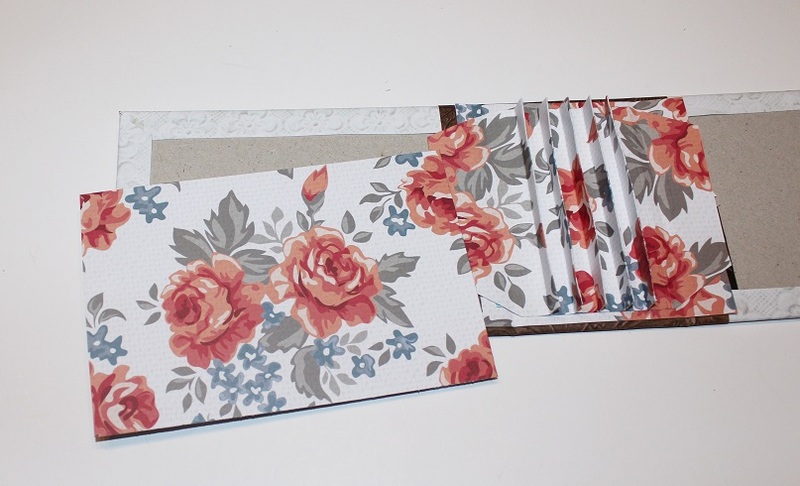 Then I added patterned paper to the inside of the back of the album. I also scored the paper that is going to bind the book (bottom of the photo). I call this binder from now on (just to make it easier to follow). This piece has to be as tall as your pages in your mini album. My album pages are 10cm tall, so this was the height of my paper. Score the strip, according to how many pages you want in your album. I have got 5 pages in my album (and flaps and tags). I started to score after 3 cm, then i scored after 1cm, and 1cm again and again (I scored a total of 16 times after 1 cm), and then cut the strip after another 3cm, after the last score. 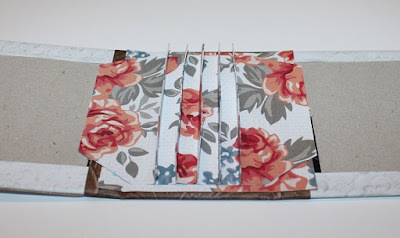 The 3cm on each side will be for used for support to fix the binding to the cover. 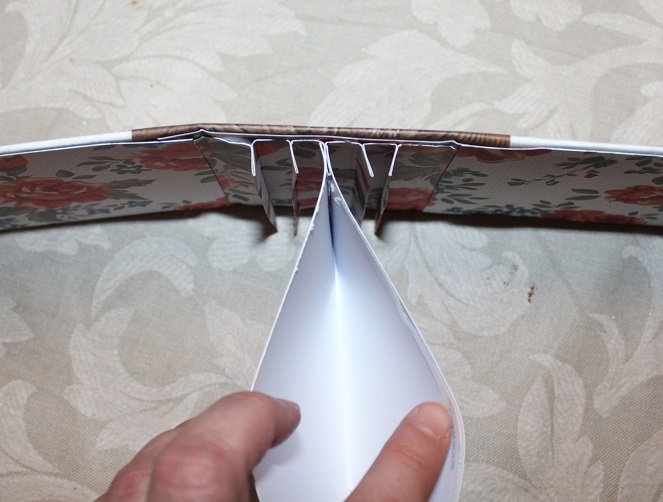 Then I glued the binder of the album, down to the back of the cover (on the inside of the cover). Make sure that the binder is straight in the middle of the back. The 3cm sides are also glued down to the cover. 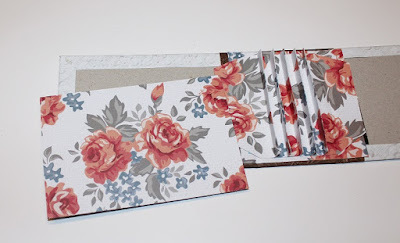 Then I added patterned paper the inside of the cover. The paper covers the 3 cm edges of the binder. Then I cut the pages. I use double pages for strength, and to make it easier to fix them to the binder. This is one of the pages with space for a tag. I fix the pages to the binder, by gluing each side of the double page on the outside of the little flip in the binder. Then I glue the pages together. Leaving an opening where I want to add a tag. Then I added the rest of the pages to the album. The album is ready to be decorated. 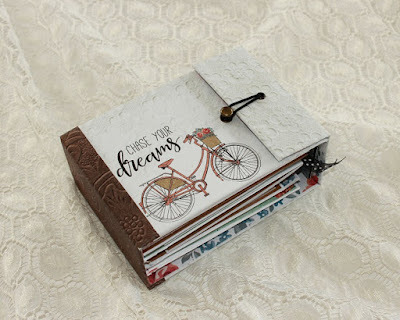 I tried to use all the papers in the collection in this mini album. 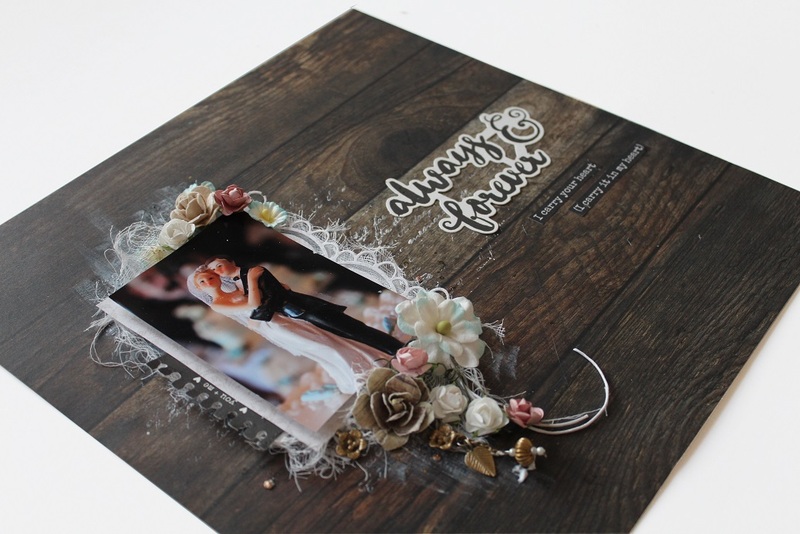 I wanted to use mixed media, feature tags, layouts and pop ups. The album has five pages, and lots of flaps and two tags. The cover is gently decorated at the front with an acetate sticker (ST928 Life).The inkpads and the mists have been used throughout the album. 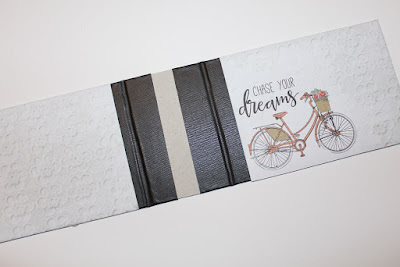 The first page is gently decorated with some background stamps, a bit of Kaisercraft's new black glitter cardstock and a notise that has been cut out from one of the papers. The first page is a pop up page. I have used gesso and Kaisermists on the background. 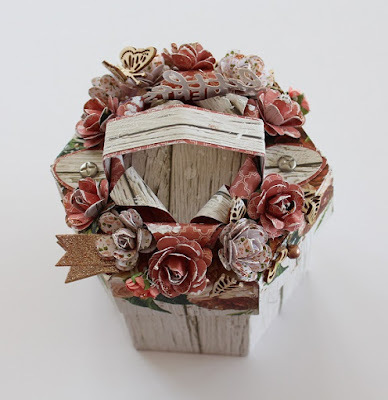 I have added pieces from the colletables, die cuts from the paper and wooden embellishments from Kaisercraft. I really enjoy creating pop ups. This is a simple and basic version. On these pages, I have used cardstock and an embossing folder. The embossing shows better in the film at the bottom of the post. 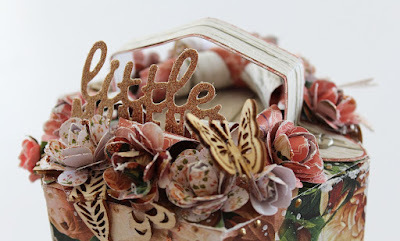 "The little things" text, is a die from Kaisercraft. 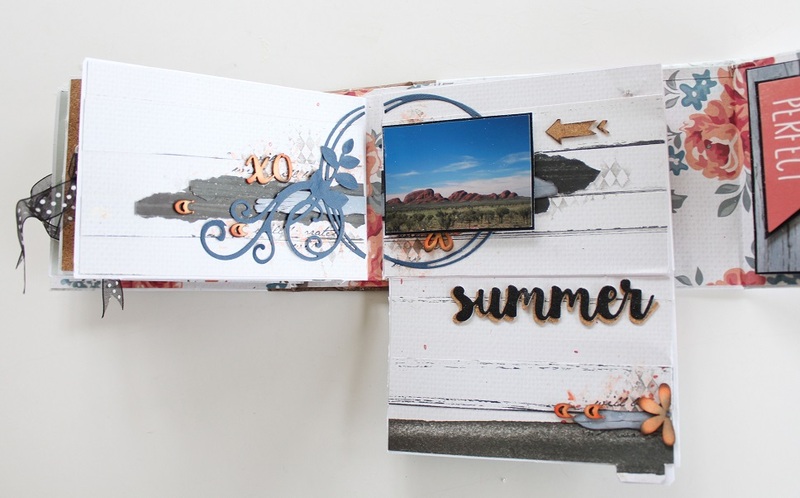 The text is created with Kaisercrafts glitter card stock. 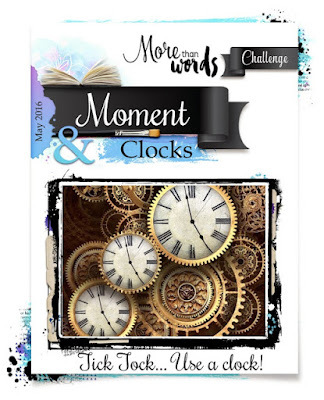 This page has been created using Kaisercrafts cork board, background text stamp, Kaisermists, wooden embellishments, Kaisercraft's stencil and the dreamcatchers from the Collectables. 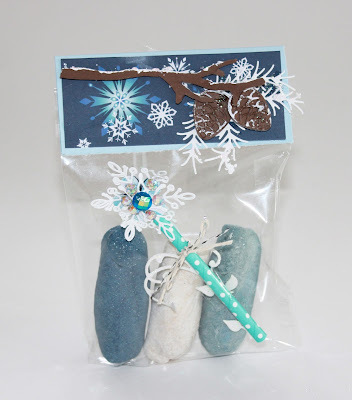 I cut the cork to size, stamped with the background stamp, and added mists as drops. I added gesso over the stencil and added finer mist using a "craft toothbrush". Then I dismantled the feathers from the dream catchers and added them, together with some of the texts from the collection. I have added some tags in between some of the pages. 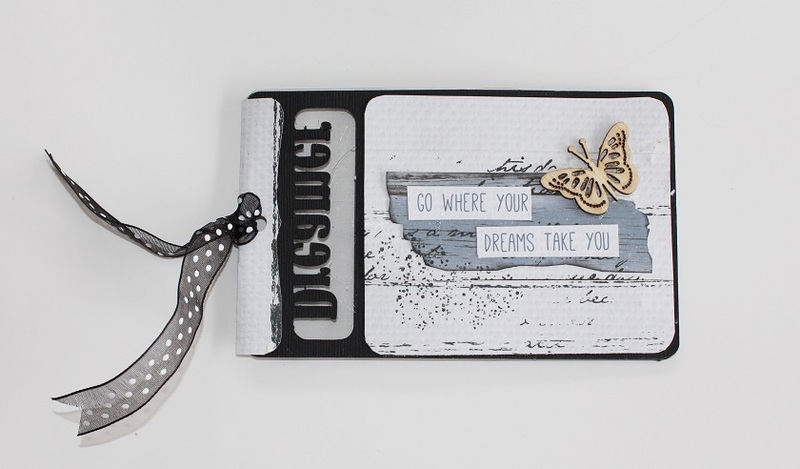 The text, dreamer, has been cut with a Silhouette. 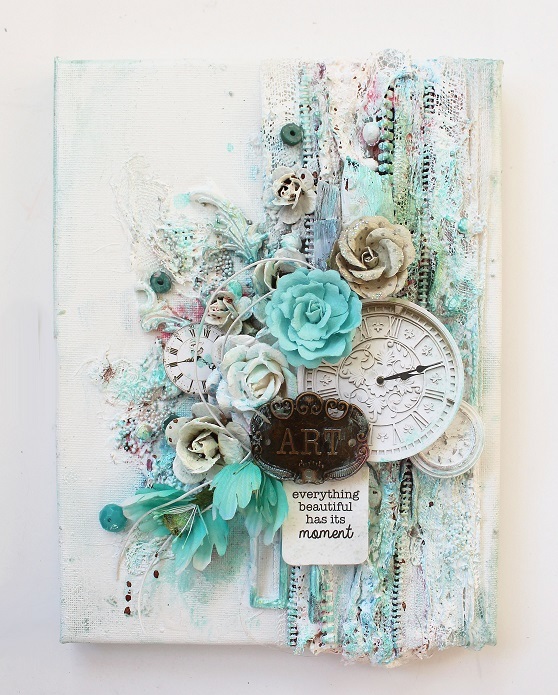 On the middle page, I have added some mixed media. 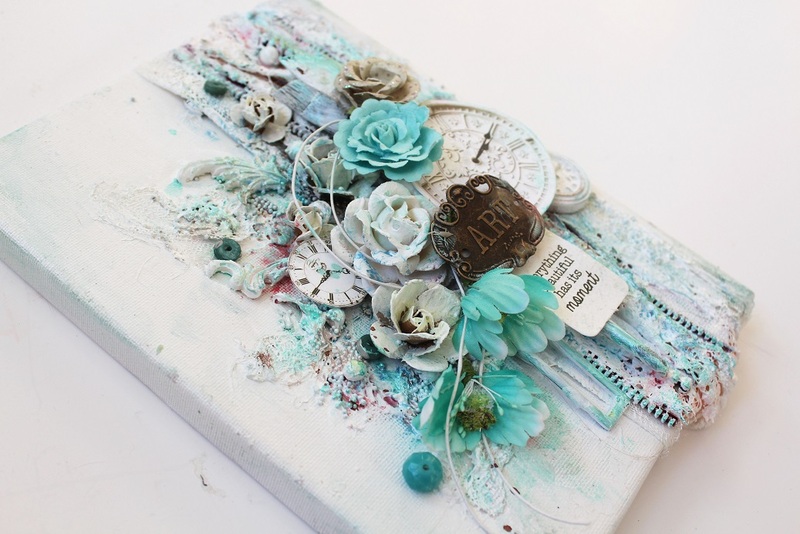 Using mists, adding some Kaiser blooms, wooden embellishments and beads. The ground is made of pieces of cork board. The Adventure awaits and the flowers are from the collectables. The first page here, is made with cork board. 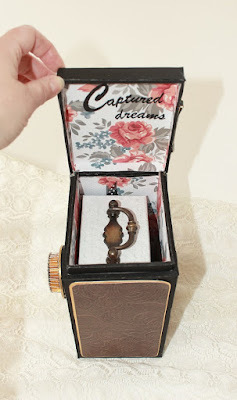 I have also used one of Kaisercraft's new dies, DD369 Decorative Die Oval Vintage Frame. I have added a piece of stamped cork inside the oval. 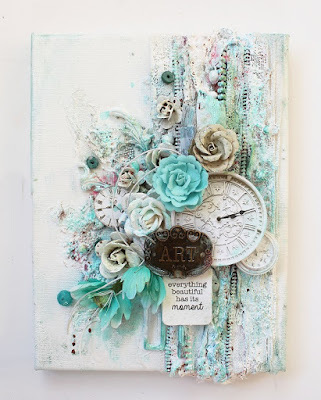 This is a mixed media page, created on Kaisercraft's Kraft carstock. 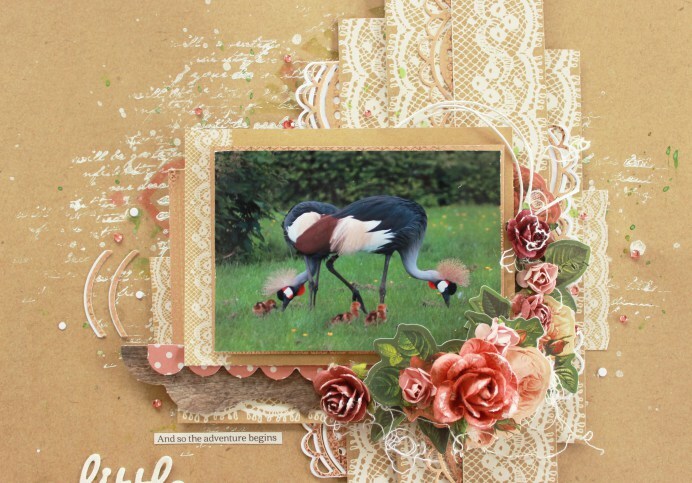 I have used the new feather template, using mists and texture pastes. The gear is a die from Kaisercraft (DD706). I have used stamps on the background and created arrows with Kaisercrafts black glitter cardstock. The photo is of me, looking out over the ocean by the amazing Rocks at Kangeroo Island. On this page, I have used white embossed cardstock. I have added a tag in between the pages. 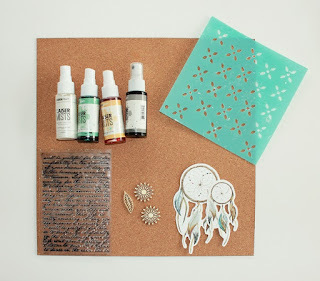 The dreamcatcher on the tag, is from the Boho dreams sticker sheet. This photo was taken in January, in front of the Hollywood sign. 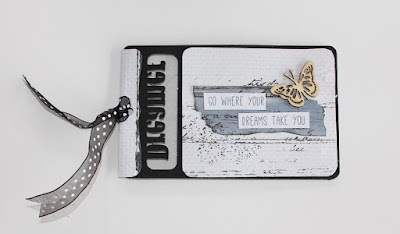 The text is a die from Kaisercraft, made from black glitter cardstock. 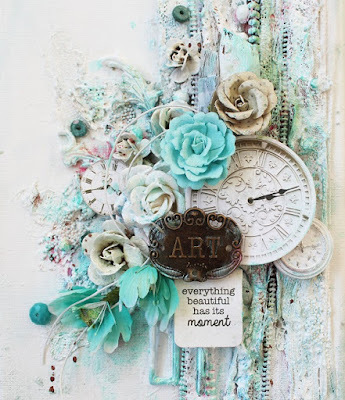 This is a mixed media page. I have used mists and background stamps on the background. Then I added paper in layers, and the circle diecut. 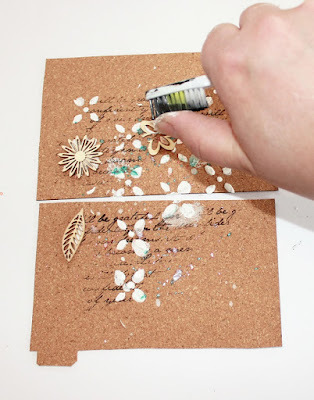 The letter "summer" are made with glitter cardstock and cork as a shadow. I have also used wooden embellishments, coloured with Kaiserink. 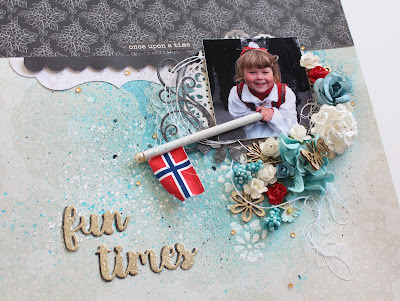 The last page is simply decorated with gesso, cork banners and a text. This page has a tag, that can be opened into a pop up page. 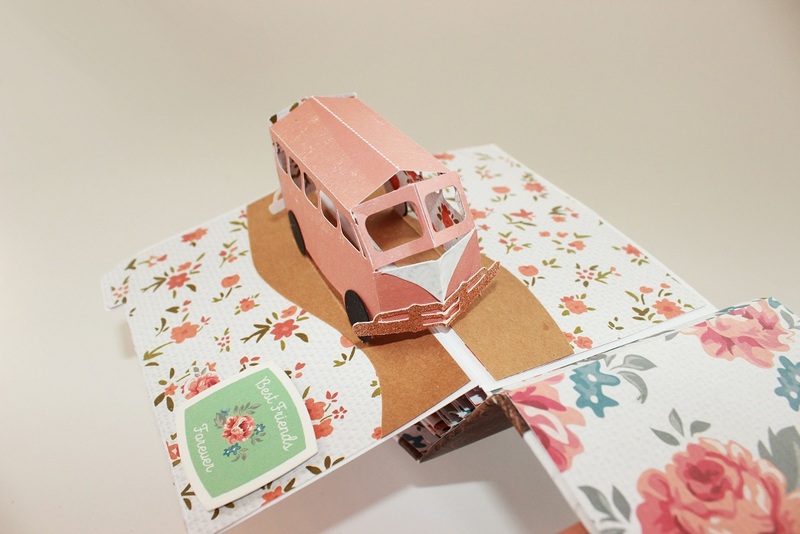 On this last page, I created a Volkswagen buss. The papers inspired me to create the bus, as the colours and patterns reminded me about the 60's.